Audrey Dyer has a surprise for the students in her Environmental Science class. She’s purposely mixed up the seeds they’d chosen and individually prepared for planting – some pots are labeled, and some aren’t. They’re going to play a scientific guessing game. Once outside, the preteen girls in their black and white school uniforms sit on the low wall overlooking the new school gardens, their headbands and braids bent over the terra cotta pots cradled in their hands, as though holding them close would make them sprout faster. The plants in their class’ original plan range from the everyday to the exotic: potatoes, corn, cucumber, okra, and rambutan. But it’s hard to be patient. The girls gently poke the soil in the pots where seeds might – or might not – be slumbering, and simultaneously scold each other: “You’re not supposed to be looking!” “It might be my watermelons!” “It might be my sunflowers!” The guessing game is meant to practice the scientific method, but they can’t help looking for their own small contributions. “As a teacher I know as well as anybody that if they don’t see it right away they’re not going to get interested,” Dyer said, with a laugh. 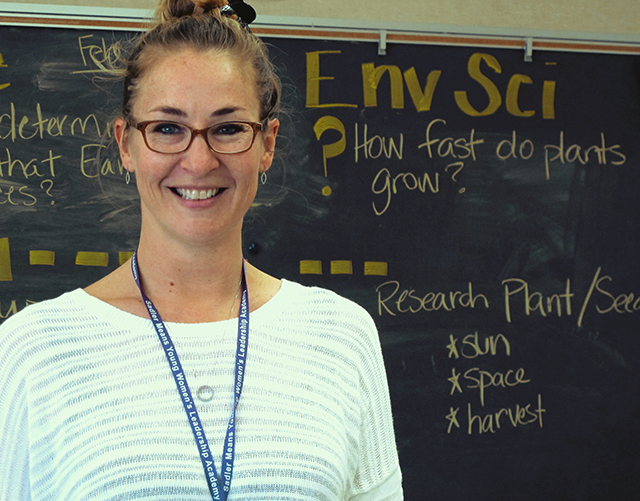 Dyer is a new partner with EcoRise, and relatively new to teaching environmental science. But her knowledge of the surrounding community’s direction have driven her to test herself and her 7th and 8th graders at Bertha Sadler Means Young Women’s Academy in Austin, Texas. Past and ongoing school projects include installing raised plant beds, a little greenhouse for the seedlings, four customized rain barrels, a butterfly garden, and a Global Awareness Club where the students run cleanups and campus education campaigns. Last year’s projects included a rain garden jointly constructed by Project Lead the Way, engineering, math and art students and lead by fellow teacher Andrea Tole. The girls now wander among painted planters and a sunflower-shaped sign in English and Spanish explaining what’s in the rain garden, how it contributes to a healthy ecosystem and how it could be improved. Though she looks forward to applying for more funding from local garden supply stores and EcoRise’s Eco-Audit Grant program, Dyer said getting resources is only part of the challenge. It’s a struggle to get some girls, whose personal lives are often at odds with their motivations to study, engaged in something bigger. 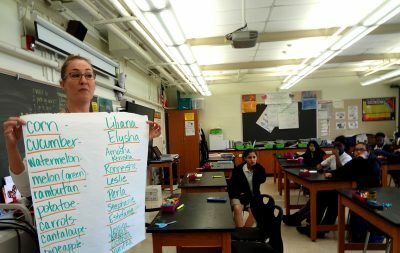 She hopes she’ll have more students next year that choose to take the class freely rather than as a requirement, but her enthusiasm and direction is already paying off. 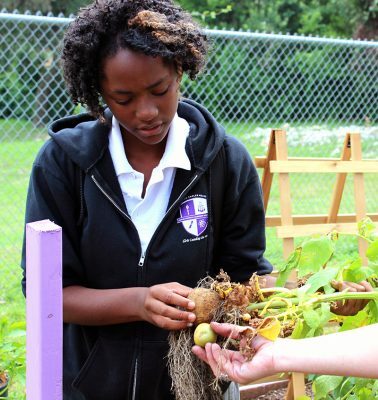 From an impromptu brainstorm in the rain garden on preventing campus littering, to chiding their classmates to leave the seeds in their pots alone, the students are slowly looking at a world beyond themselves, stepping up from girls to young women.